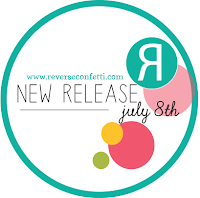 All of the fabulous products that we have been showing over the past few days will be available for purchase tomorrow at Reverse Confetti! Today we are featuring My World and the Globe Confetti Cuts. The Globe Confetti Cuts made me gasp when I first laid eyes on it! It is so stunning and different from everything else in my stash. It makes a perfect focal point on a CAS card or an accent to a technique-y piece. 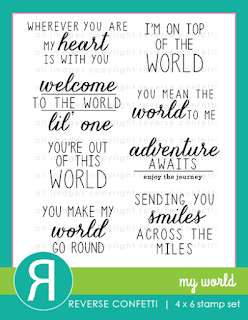 I love the variety of sentiments included in My World, you could literally make a card for any occasion. 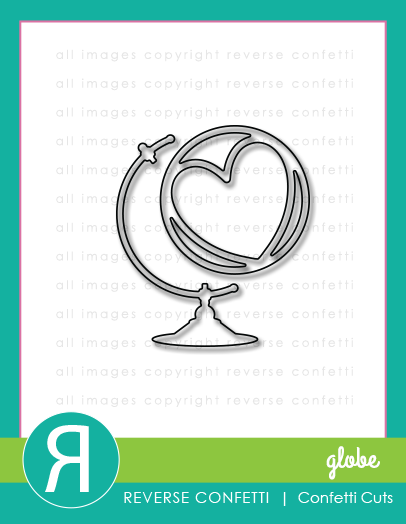 For my card today, I was going for a life-like look for my globe. I watercolored with distress inks on watercolor paper and just added drops of blue and green. Once dry I chose an area that I thought most depicted the globe and then die cut the globe from that. I really wanted this globe to take center stage, so I kept the rest of my design CAS, only adding score lines to ground my design. I'll be sharing another card I made using this die soon! Stay tuned! Seriously love this! 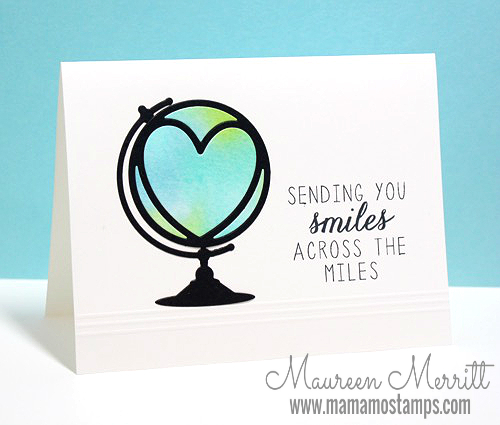 What a fabulous stamp and coordinating sentiments! 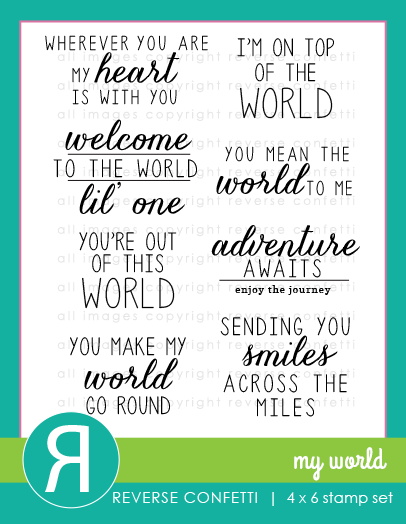 I love it - I am a map and globe fanatic and this card is wonderful. So pretty! Love how the watercolor looks with the black. How cool is this?! Love!!! Love this card; Of course, I'm now adding more items to my wish list! Love the globe with the heart. Very different and a great idea. C & S very nice card !!! Love how you colored the world. Looks great. A plain and simple card that is so pretty. Love the simplicity of your card with the watercolour. Very nice. Very pretty way to color the globe. So CAS! Love what you've done!